Even if you’ve never tried a recipe box, I’m sure you’ve heard of them. Boxes of ingredients delivered to your door containing everything you need for two or more dishes, along with step-by-step instructions simple enough for even the most novice cook to follow. On the face of it, these boxes can seem like an extravagance or an unnecessary luxury but, when you think about it, if you had to buy all the ingredients you needed for a meal, you wouldn’t use in that one dish everything you bought – one tsp of a spice out of a whole jar/a handful of spinach out of a whole bag, for example – and, as everything’s pre-weighed for you (if a dish needs one tsp of a spice, one tsp of spice will be in the box) as well as there being no waste, there’s also no messing about with scales and measuring spoons or cups. 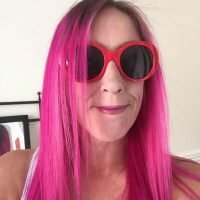 I’ve tried a few recipe boxes in the past and have been impressed each time (especially as the portion sizes have been generous and usually stretched to double the quantities they say they serve). Despite me waffling on about recipe boxes, this Asian Mushroom Broth with Udon Noodles wasn’t created from a recipe box but it is from a recipe box website – Hello Fresh’s, to be precise. Hello Fresh have a range of recipe boxes, including their Family Box, Classic Box, and Rapid Box. 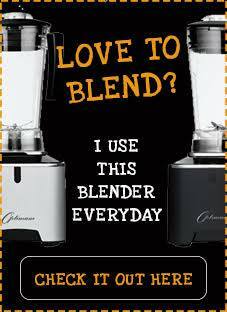 Each box can be tailored for a different number of people and you can choose how many recipes you’d like per week. At the time of writing, each meal costs £5.83 a head which, let’s face it, is a lot less than you’d pay in a restaurant or for a takeaway. 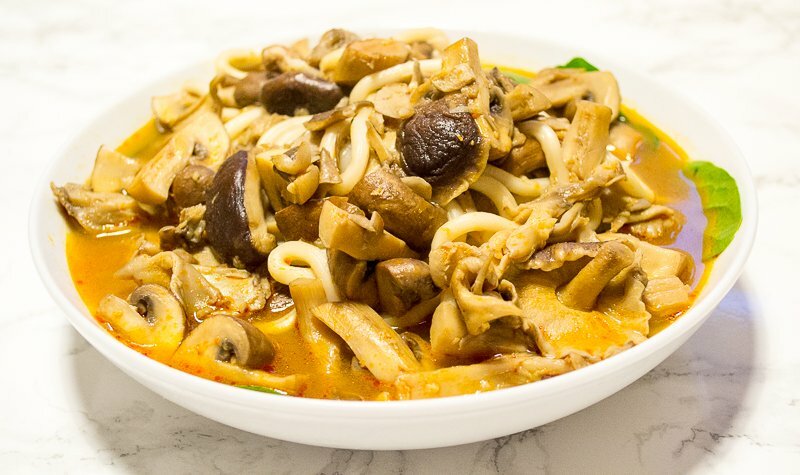 Hello Fresh also have a range of recipes on their website, including 10 vegetarian recipes, and below I’m going to recreate their Asian Mushroom Broth with Udon Noodles in a step-by-step Hello Fresh style. This dish is light and tasty with a bit of a kick from the curry paste. As an added bonus, it’s quick and easy to make and doesn’t use many bowls, meaning not much washing up. 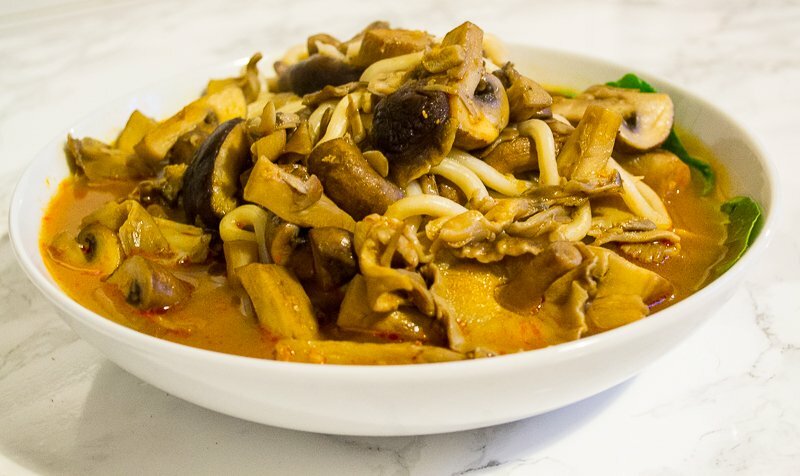 I used a box of ‘British Speciality Mushrooms’ (maitake, shiitake, oyster) instead of enoki mushrooms as Sainsbury’s didn’t have enoki mushrooms. 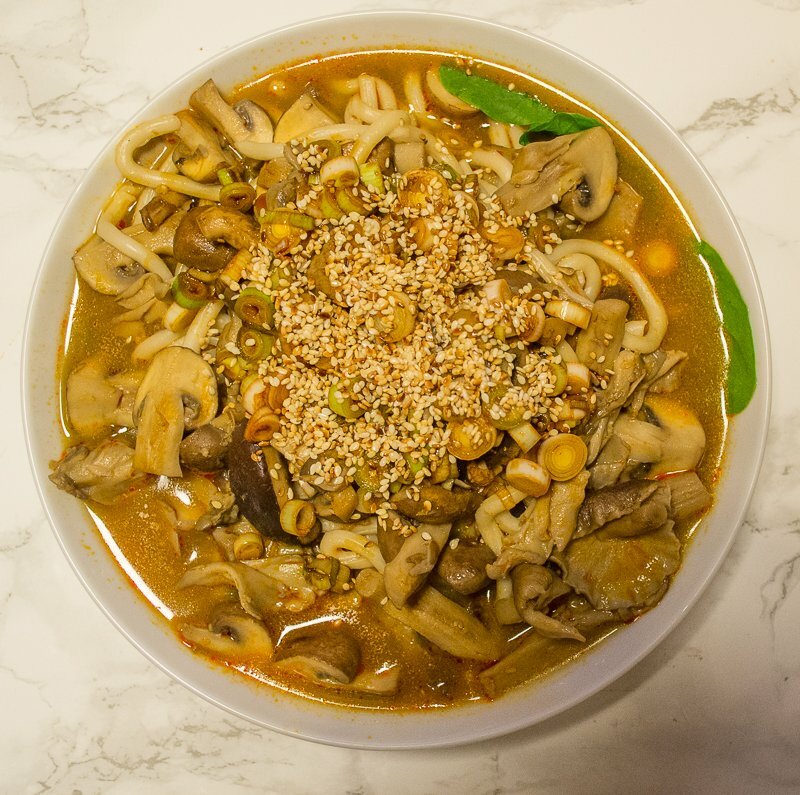 In Hello Fresh’s recipe, their enoki mushrooms were added raw on top of the broth at the final stages. I didn’t fancy raw mushrooms so I cooked my speciality mushrooms along with the chestnut ones. I used 3 cloves of garlic as opposed to Hello Fresh’s 1 clove because who the flipping flop only uses one clove of garlic? I left out the coriander because I don’t like coriander. 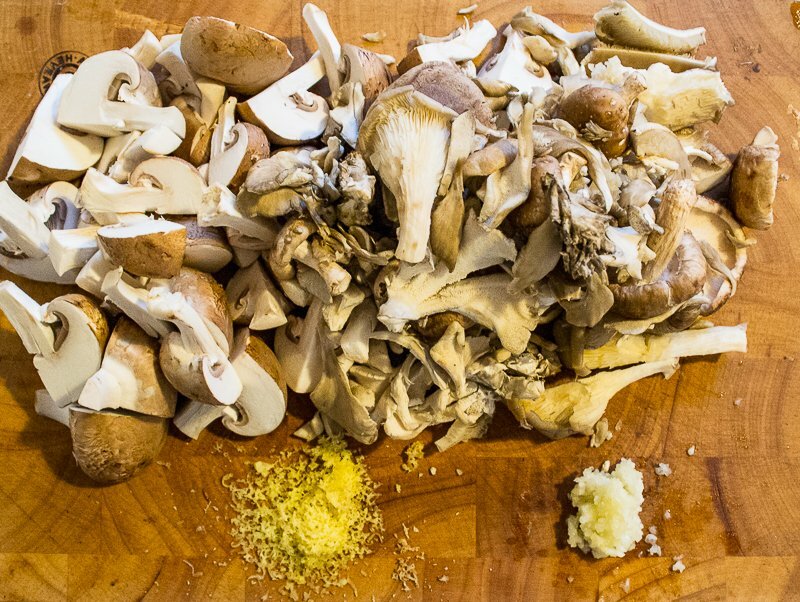 Hello Fresh’s recipe calls for a punnet of mushrooms. I’m not sure if ‘punnet’ is a recognised unit of weight but I used a 250g box of chestnut mushrooms and a 200g box of mixed mushrooms and it seemed the right amount once the dish was finished. They also said to use 1/2 a bag of spinach but didn’t specify how big a bag, so I used two large handfuls. Hello Fresh’s recipe called for a ‘glug’ of oil. Whenever I see chefs on the telly using a ‘glug’ or a ‘drizzle’ it always seems to be about half a bottle but I showed a bit of moderation and used about 1 tbsp. The oil was unspecified but I used toasted sesame oil for some added Oriental taste. I used those straight-to-wok noodles. I used Blue Dragon red curry paste (clearly labelled vegan on the tub). 1. Quarter the chestnut mushrooms and slice the speciality mushrooms. Grate the ginger and crush the garlic. 2. 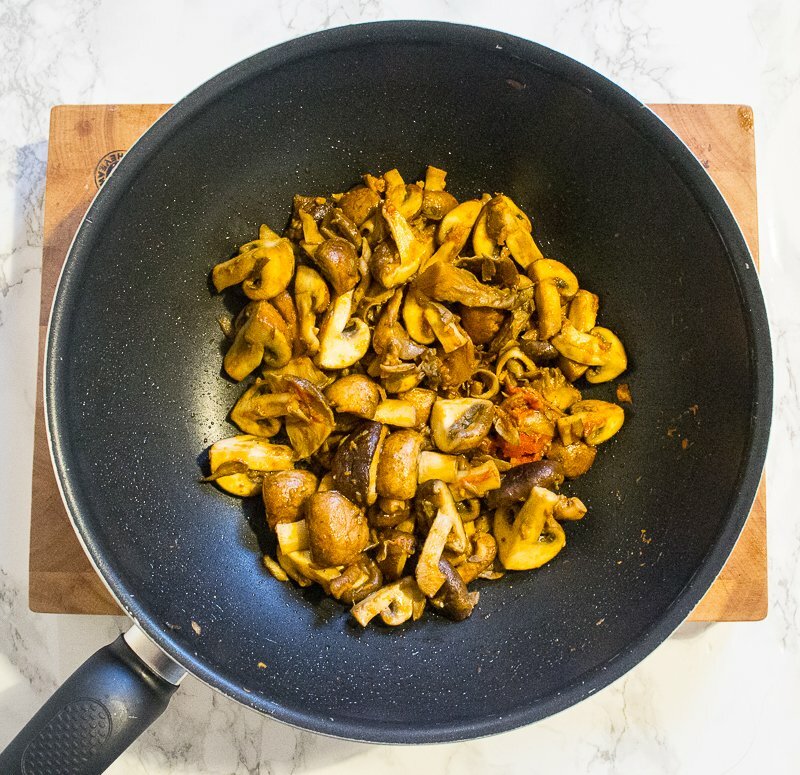 Heat a large saucepan or wok over medium heat and add the toasted sesame oil. Add all the mushrooms and cook for 5 minutes until browned. Add the ginger, garlic and red curry paste. Cook for another minute then pour in the water. 3. Once boiling, reduce the heat and cook for ten minutes. 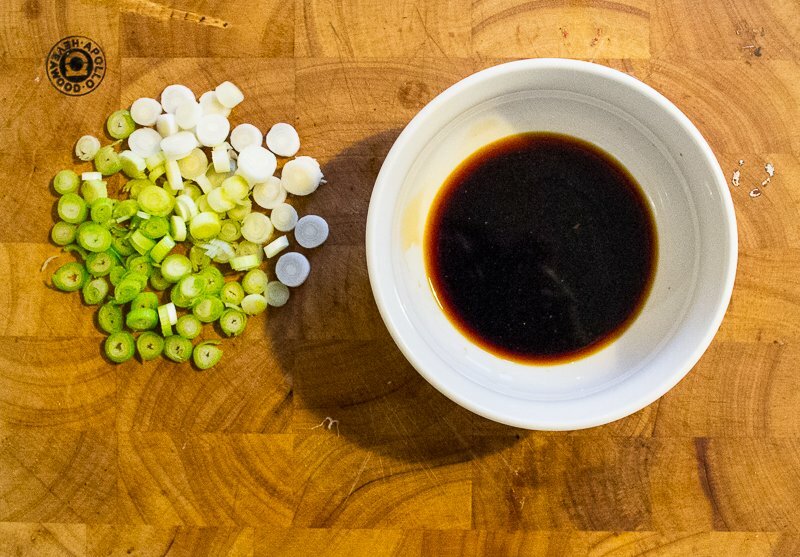 Meanwhile, slice the spring onions, pour the soy sauce and rice vinegar into a bowl, then mix in the sliced spring onions. Keep to one side. 4. Once the broth has been simmering for ten minutes, add the udon noodles and heat through. 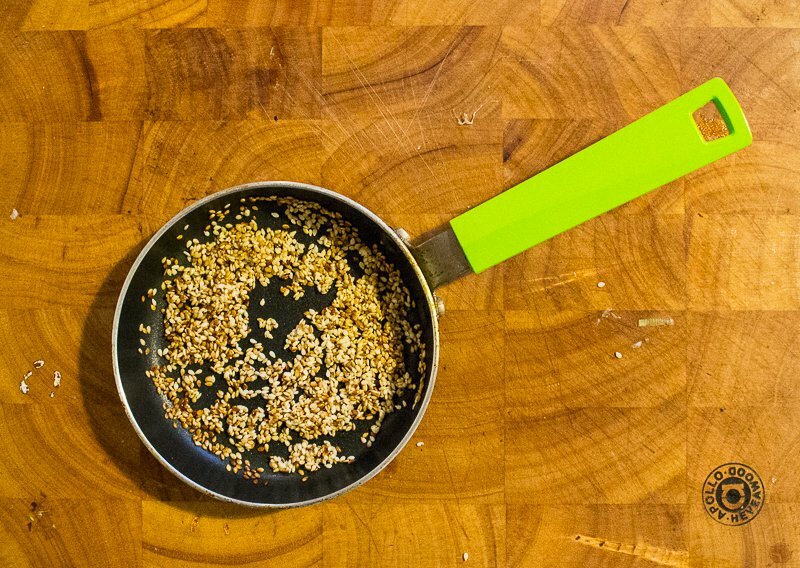 In the meantime, heat a frying pan over a medium heat and add the sesame seeds. Cook for two minutes without oil, stirring now and again to get an even colour. Remove from the pan when they are golden brown. 5. Put a handful of spinach into the bottom of your serving bowls and ladle the hot broth into the bowls, then spoon over the soy sauce, rice vinegar and spring onion mix, then top with the toasted sesame seeds.